Despite the long list of ingredients needed for this recipe, it was well worth it in the end. 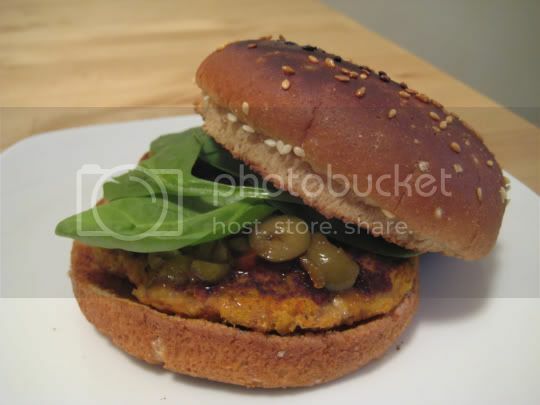 These spicy, flavorful, filling burgers are topped with fresh, crunchy spinach leaves and a salty-sweet olive and marmalade mixture. This relish was easy to make, and as frightful as I am of olives, this was actually quite delicious. Black olives are just the crust of the earth, but the green olives...those salty, briny, tangy, juicy things can (at times) be great...as long as they're not eaten alone in my opinion. So the sweet, pungent bitterness of the orange marmalade was a perfect complement. I would suggest doubling the relish amounts, because it really isn't enough to last for 8 burgers, and you will really want to load it on. The burgers were easy to make, and all of the ingredients were a perfect combination. You can really taste the oregano, and depending on what kind of salsa you use, these burgers can really have some kick (I used a "medium" variety). The manchego cheese added a nice salty but savory flavor (why is this stuff so expensive? geez, $8 for a wedge at Trader Joe's). I did need to add an additional 2 slices worth of bread crumbs for these burgers to hold together, but maybe that's because my "chunky" mixing attempt in the blender turned into more of a puree. Still, they were very soft when forming into patties, but a nice pan-fry of about 5 minutes on each side really firmed them up. Make again? Definitely. I will try to halve the recipe next time, as these made 8 burgers. The leftovers were good, but I don't want to be eating 8 of these things in a row.